A tell-tale sign of spring’s arrival, asparagus is, once again, in season. Across the country, an interminable parade of restaurants is currently showcasing these vibrant spears through exciting, often unique, recipes. 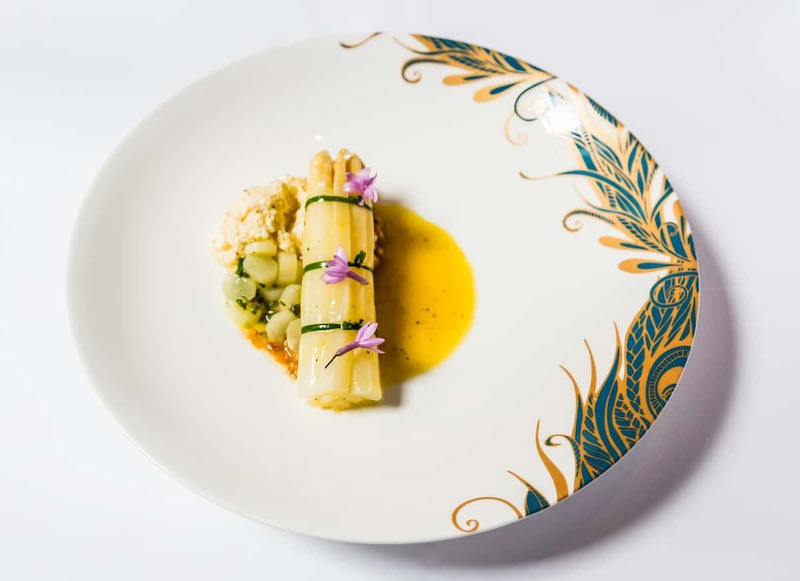 Using white asparagus, admired on the continent, The Baptist Grill at L’Oscar near Holborn is currently serving an elegant dish crafted by Executive Chef Tony Fleming – formerly of Angler. Teaming steamed white asparagus with homemade jasmine honey; pine nut praline with a whisper of garlic; and fresh ricotta, the dish has an exceptional balance of both flavour and texture, worth every second of the preparation time. (N.B. Save time by making the jasmine honey in advance). Peel the white asparagus evenly, removing as little as possible if thin but going around it twice to remove all the stringy bits when thick. Steam the asparagus for 10-12 minutes until just tender, check with the tip of a sharp knife, it should slip into the bottom of the asparagus with little resistance. Refresh immediately in iced water. When cold, remove and place on a tray in fridge to dry. To portion, cut asparagus to 12cm from the tip allowing 5 spears per person. Cut each spear into halves when small and quarters when larger while keeping them whole so they appear uncut. Lightly dress the pine nuts in the rapeseed oil and toast on a flat tray in a preheated oven at 170C until golden throughout. Leave to cool. Roughly chop half of the pine nuts. Blend the remainder with the olive oil, garlic and salt, on a low speed in a blender, to a coarse puree. Mix the chopped nuts into this. Bring honey and water to the boil and add tea. Allow to cool. Blend the jasmine honey, salt, zest and juice together. Place the milk, buttermilk, cream and salt in a pan and gently bring to 82 degrees Celsius. Add citric acid and stir to dissolve being careful not to agitate too much. The milk should start to separate leaving a pillows of curd surround by a greenish whey. At this point leave to cool slightly before straining over muslin/cheese cloth and hang until firm. When curds are dry, refrigerate. Place a spoon of the pine nut praline on to the plate. Dress the slices of asparagus with a little of the dressing and season with sea salt, place this over pine nuts. Place a spoon of the ricotta next to the asparagus slices, drizzle over a little jasmine honey and a pinch of sea salt. Place a bundle (5 pieces) of the cut asparagus stems next on to the ricotta, season with sea salt. Pour a generous amount of the honey dressing next to the asparagus and serve. Further information on The Baptist Grill can be found here.